Chard risotto with a soupçon of whining. All the cool kids on the Food Internet are writing about cucumbers and zucchini today, but I’m all out of cucurbits and also incredibly uncool. Today we had chard – it’s been sitting in a vase beside a window for the past two days, getting brighter, bushier, more lovely. The trouble with buying produce at markets along my bus route home is that I have to carry the produce home on the bus where it inevitably wilts. A little bit of care and water upon arriving home does wonders, and in the meantime chard makes a very pretty centrepiece. I had to take the bus home wearing near-non-existent footwear, and quit on my “shoes” at my stop and walked home barefoot along a busy city street and I might have caught foot syphilis. These are first-world problems, but incredibly dramatic when one is focused entirely on herself. So we ate comfort food, with my beautiful red chard, and Nick bought beer and pretended like I was a rational human being, and now everything is almost better. Thanks, risotto. Wine and cheese have never not helped me yet. In a heavy-bottomed pan over medium-high heat, heat oil and melt the first tablespoon of butter. Add onions, garlic, and the chopped chard stalks and cook for two to three minutes, until onions are translucent. Add rice to pan, stirring for about a minute, or until rice grains turn opaque. Add leaves. It will look like your ratio of rice to greens is off. It will look this way for a long time, but it’ll all work itself out. Pour in wine, and scrape the bottom of the pan to ensure nothing has stuck. Add pepper and nutmeg. Cook until wine has been completely absorbed. Add one cup of the warm chicken stock, stirring frequently until liquid is mostly absorbed. Repeat with an additional cup of stock, and then repeat again with one to two more cups as needed. Test your rice for tenderness – if it is al denté, great. If it isn’t, just pour in a little bit more stock, as needed, and let it absorb into the rice. When rice is ready, stir in butter, Parmesan cheese, and one tablespoon of the basil. Adjust your seasonings, to taste. Serve hot, with additional Parmesan cheese and a light sprinkling of chopped fresh basil. The whole process takes about 30 minutes, but believe me, the stirring and the smells are therapeutic. Plus, who opens a bottle of wine to cook with and doesn’t dip in? Try 30 minutes of cooking with the bottle all to yourself, and tell me you don’t feel better about everything, even if you were fine to begin with. < Previous Meringue held up my fruit and yogurt this morning, and thus Tuesday was vastly improved. Next > Blueberry crisp and a lot of procrastination. Nom nom nom… and sorry about the rotten day. I hate it when I end up looking like a zombie movie extra in the middle of a workday. Risotto is my hubby’s new favorite thing! For him it MUST contain peas, and then all is right with the world. 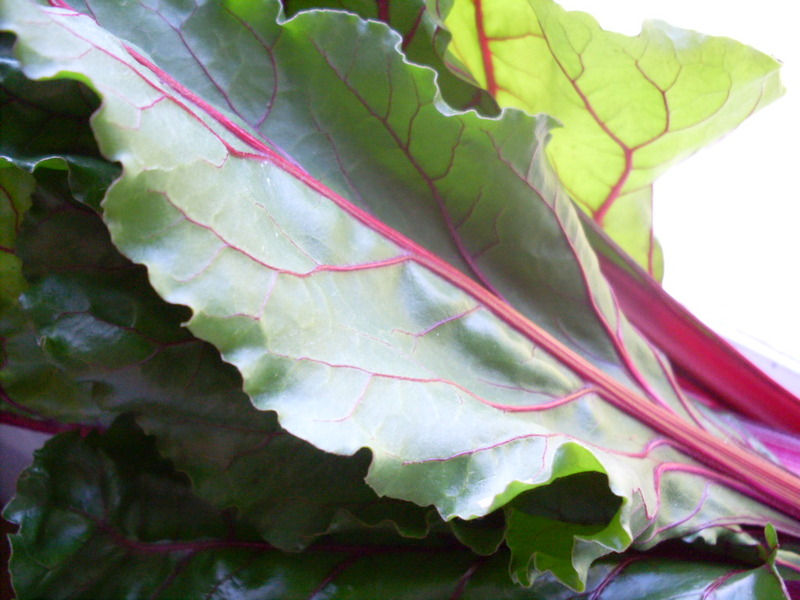 But mmm, chard. I didn’t know you could fluff it up in a vase of water — I will totally try that next time I get some weird looking chard from the CSA or anywhere. Poor footies. Soak them and treat them to some lotion and some fuzzy socks. They’ll forget all about foot syphilis. I know, right? I tried way harder to look like a grown-up today, except for the cleavage, and I think it paid off. 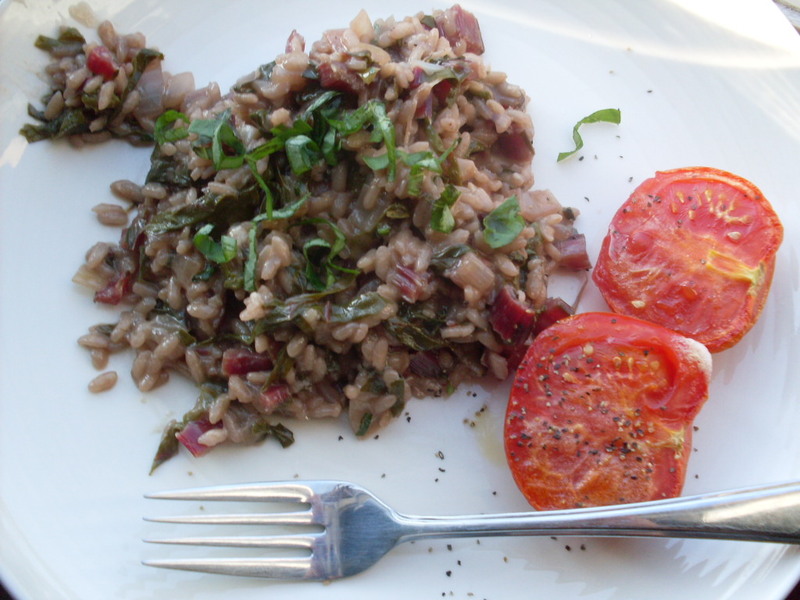 You should try risotto with greens! It’s excellent with spinach too. Though I have to agree – risotto with peas is pretty fantastic, and it’s the right time of year for them too. I think they’ve forgotten about the syph, but now they want a new pair of gold sandals. How are you? How far along are you? Risotto for dinner tonight! The kind with peas because it was a special request to soothe Pat, who had a nasty shot today (DTAP, to protect the baby — we have an epidemic of pertussis in our area), but the kind with greens WILL happen soon. I added lemon zest at the last moment and it’s so good. Soccer ball?! Terrifying! But exciting nonetheless. You should email me an address so I can send a card or something your way. Yes. Yes you should. Not too many weeks to go! Eek, I heard about that outbreak. Sounds awful. And shots are never good. Risotto ought to have done the trick, especially with peas and lemon zest. We went to buy new gold sandals but somehow Nick ended up with a sweater vest and a pair of shorts instead. If he wears them both together, I’ll make him take them back. Can you at least bear flip-flops? They’re comfortable, and nonrestrictive! I don’t like things between my toesies, which makes me terribly unfashionable these last few years. But really, it makes me insane! He ate more risotto than I have ever seen a human eat, and today he’s cheerful, so it must have done the trick. We’d be less paranoid, but he’s a college teacher and so… he gets exposed to this stuff. Aw, you’re sweet! I will send you my address. You are wonderful to ask for it.